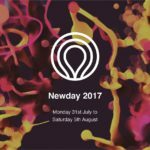 Our annual visit to the Norfolk Showground to participate in the Newday event. 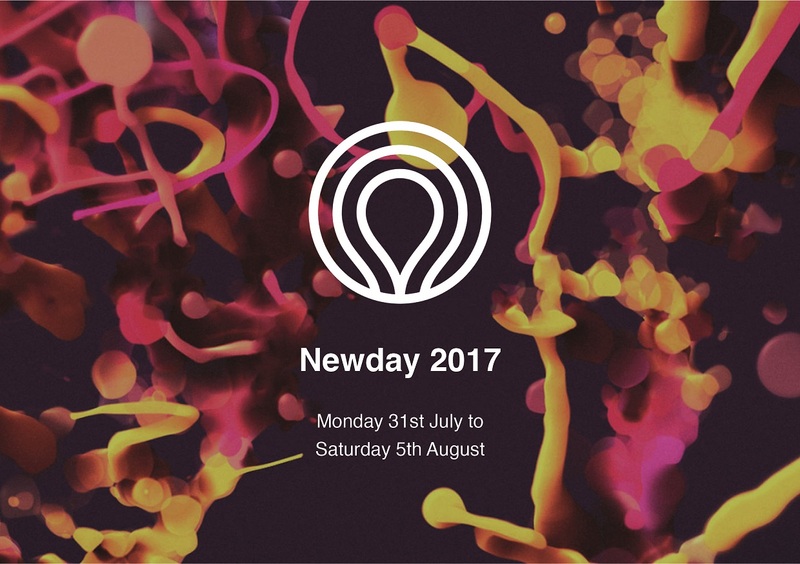 Newday is a major youth event, a summer camp, aimed at young people between the ages of 10 and 18, that takes place in the heart of Norfolk, with thousands of young people over about 6 days. 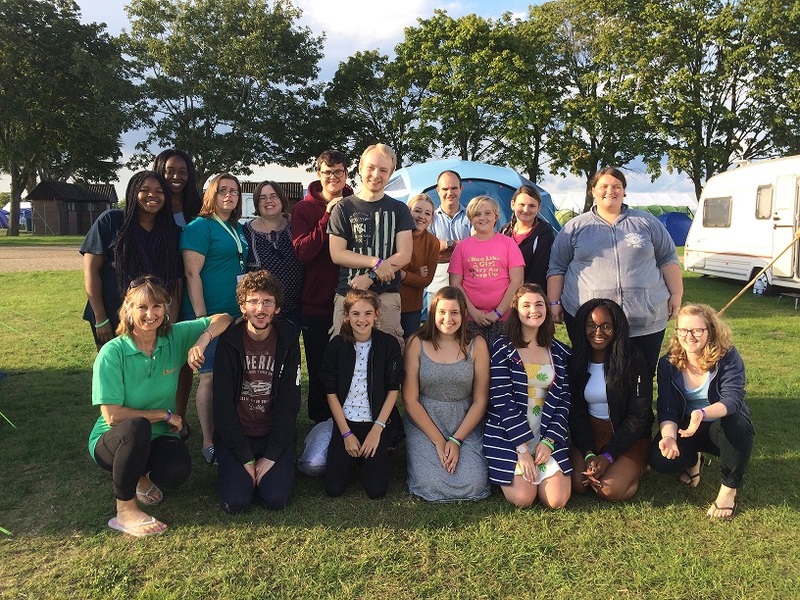 This year was our smallest camp in the 9 years of attending Newday. As usual we teamed up with Identity Youth Project and took 7 young people under 18 plus 8 delegates who are over 18. Sadly we had to say goodbye to Julyan on Tuesday as she felt unwell so there were 18 of us camping. Many arrived having had difficult situations to deal with since we were all together last Newday; or with burdens of low self-worth and guilt for things that had been spoken over them for months by the enemy via other people and had resulted in a real sense of being unfulfilled and doubting who we are in Christ. As we were planning this year, the overwhelming expectation was that God in His infinite kindness was going to bless these young people with a knowledge deep in their “core” of His love for them and to bring freedom from their burdens of unworthiness and religiosity. For those of you who attended the prayer meetings back here in Gt Yarmouth you will know that this was the crux of our prayer requests from the site during the week. Thank you for standing with us during the week. 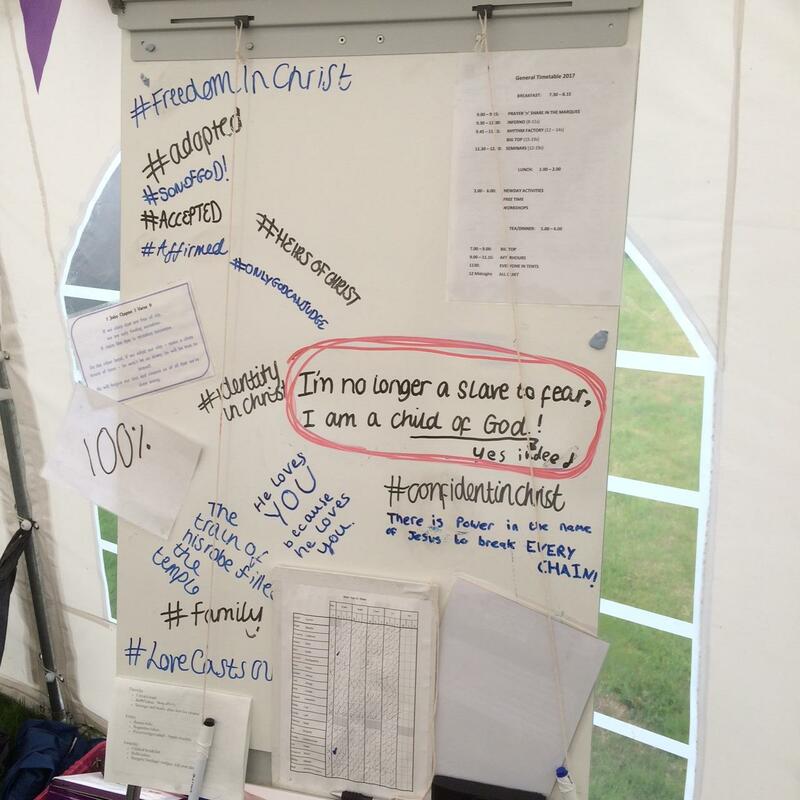 We started on Sunday with the “Dream Team” equipped with site plans and energy, erecting 6 tents and setting up the marquee as a kitchen/ dining/socialising area. 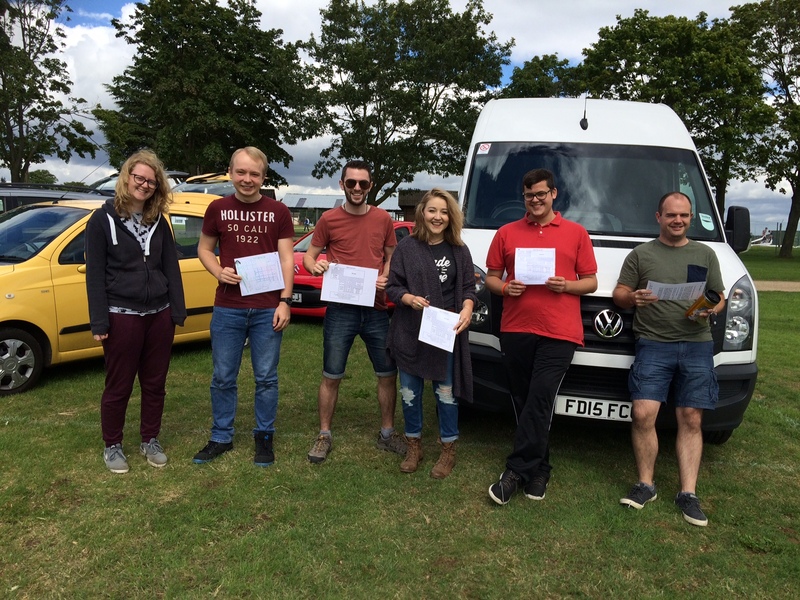 A huge thanks to Ben Pillar for stepping in to help, with his vast camping experience! Pearl Breeze (Ali’s mum) provided an exquisite 3-course meal for sustenance and by the time it got dark we were ready and excited to welcome the young people on the Monday. 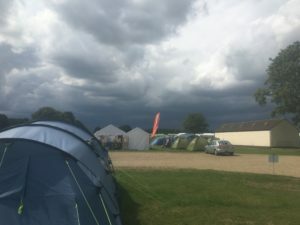 Everyone arrived safely and got stuck into the new regime of a more laid back and all-inclusive campsite – where all-inclusive means that everyone is included in ALL the washing up (no rotas!) and in the food prep wherever necessary. Sadly our faithful and wonderful chef of the last 8 years, Lynda Lee was unable to camp with us this year (the first year she has missed!) due to family commitments but she bravely came along as a day visitor to help out on Monday, Wednesday and Friday. 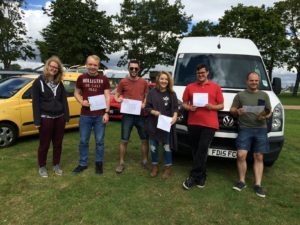 She was sorely missed but our trusty trustee, Matt Woollard-Kingston and his wife Amelie did a sterling job in feeding the 18 of us, as well as Matt filling his usual role as site manager! Our prayer requests included energy and patience, grace in our conversations and joy in our hearts and (as usual) God provided everything we needed. The weather was pretty changeable this year but again, in His infinite love and kindness God said “yes” to our prayers for protection from the storms. We are also grateful to PartyOn Marquees of Acle, for their provision for a sturdy and weatherproof marquee that withstood the 35-40 mph winds. The week was filled with fun activities provided by Newday and some really inspiring speakers for the week. Joel Virgo led the morning sessions on the book of Galatians and the evening sessions were led by Joe Macnamara (our freedom in Christ); Andrew Wilson (Isaiah 52), Francis Chan (the majesty of God), Livvy Gibbs (Escape or Infiltrate) and Tope Koleoso (being Fearless). They were all amazing talks and are available on Soundcloud if you’d like to listen. “Psalm 91 v 4 has been shared this week about 5 times from different places “He will cover you with his feathers, and under His wings you will find refuge; His faithfulness will be your shield and rampart.” I have been really struggling with life recently for a number of reasons but I now know that He will cover me with his feathers and I will find refuge under His wings. Three people from our site were healed on the Thursday evening when we were prayed or in the big top: One of us has had tenosynovitis in her wrist for years but is now 70% free of pain; a person who had fallen down stairs a few days before coming on camp had extreme pain when sitting down but now is completely pain free; one of the delegates has had a very painful hip condition for many years but after being prayed for now has no more pain and Ali’s hand was extremely painful and swollen for the whole week until the prayer for healing, when God healed her enough to continue the week with significantly reduced swelling and pain. 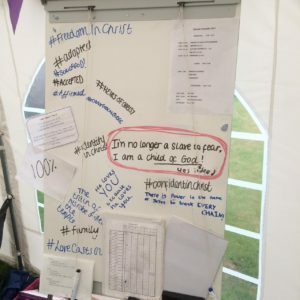 In addition to all that God has shown them through the sessions, the one-to-one conversations back at the marquee base camp have also enabled them to be honest and open about their struggles and pray through them on an individual level, bring freedom and breaking the chains of fear, unforgiveness, resentment and hurts. So, after seeing how our amazing, infinitely unchangeable, stunning God is working in the hearts of the young people, how He is strengthening them, equipping them, loving and blessing them, the answer to the question “What is the lowest number of people you would do this for?” is probably 1! Thank you to everyone who supported us financially and prayerfully, who lent us equipment and have donated tents over the years. Thanks also to Ruth and Dan Witheridge for their revitalising energy on the last day as they came over to Norwich to help pack down the tents/site and also unloaded the van back at Yarmouth. Please continue to pray for those who were there – that they will continue in the closeness of their relationship with the Father and will get plugged into groups and opportunities to go deeper into Him with other Christians.